As your Trusted Advisor’s, we will sit down with you to find the optimum audio/video solution for your business. Any source in any room or space, that’s what distributed audio is all about. Whether you’re in the lunch room, conference room, executive suite, boardroom, or even the restroom, we can distribute audio anywhere. Any source means it can come from the paging system, radio, CDs, iPod, satellite, or media server. Access is simple. A wall mounted touchscreen allows the user to select a source and set the volume. Shore 2 Shore Automation can design and install a system to distribute high-definition video throughout your business to multiple displays from multiple sources. 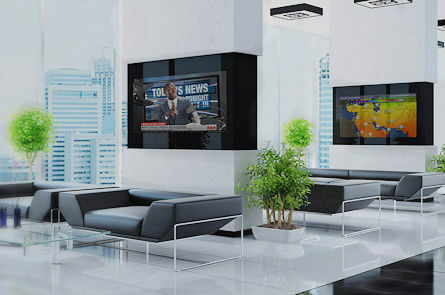 We can implement a system that will meet all your multimedia and digital signage needs. We can help your business deliver your message using eye-catching displays, distributed audio, and easy to use control systems. Whether you require distributed video for a restaurant, bar, conference room, auditorium, retail space or fitness centre, Shore 2 Shore Automation can provide you with an effective yet simple to use system. Choose from a wide selection of LCD flat screens, or projectors and wall screens to meet your organization’s needs. Choose from the basic option of volume control knobs or replace those with wall mounted touchscreens offering additional control possibilities. With touchscreens or keypads in each location, the user has the flexibility of choosing any source. Operation of our systems is simple and can be learned in a matter of minutes. You also don’t have to listen to the same music throughout the entire facility. Choose a source for each room or space and give multiple listeners the chance to enjoy different sources.